I have been on a 24 Day Challenge with Advocare. It has gone well. I wanted something to “kick-start” my new year, motivate me to “clean up” my eating a bit, rid me of the sweet cravings etc… I can say the challenge has done all that. I have not lost as much weight as I would have desired (only 4 pounds), but I am only 15 pounds over my goal weight and the area of concern to me is that Second Season Mom (those of us over 45) muffin top. It just appeared, and well is proving much harder to make disappear. So… all that to say, I am pleased with my 24 Day Challenge. I have learned several things, but most of all have been reminded I MUST take care of myself during this Second Season. It is hard to do. You think when your children are little you have no time. Well, I now argue it only gets busier on the other side. Many, like me find you are now not only taking care of kids, but still taking care of home and most likely aging parents. You have also established a reputation within your community and are most likely serving in a number of volunteer positions and called upon through your church to assist. It is all good, but I am reminded weekly, the biggest struggle is choosing to do what is BEST. (I’ll do a whole other post on that in weeks to come.) This challenge has reminded me that exercise (my area of weekness) and eating right are a part of what is BEST. However, I can’t live on veggies and fruit and have also come to realize cooking yummy foods and sharing them with others is a huge part of who I am-Southern Heritage, spiritual gift of hospitality and lover of cookbooks and food! I can however, continue to educate myself on how to lower the fat content, use less white flour products, bring out the spices and still enjoy being a Southern Cooking Mom. One of our winter go to dinners is meatball sandwiches. As you can see I usually serve them on Hawaiian Rolls. Yes, those wonderful, sweet, soft rolls. I am thinking next time I’ll try my hand at some whole wheat rolls. 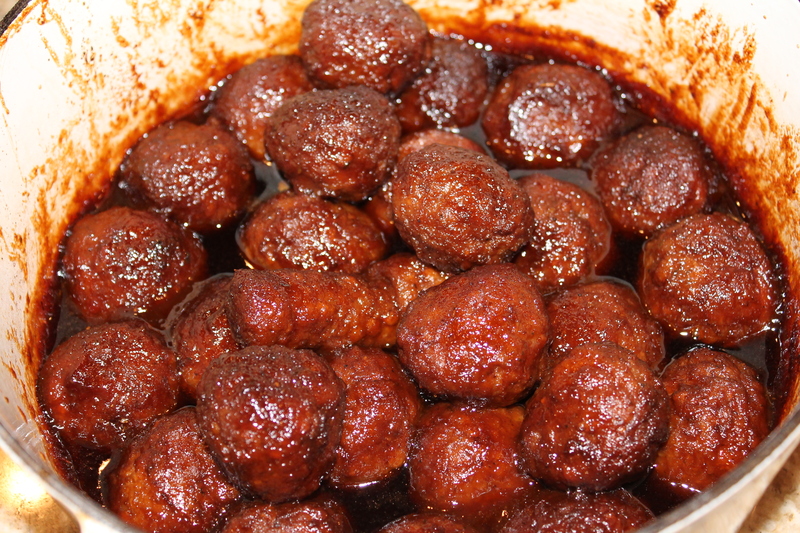 I purchase frozen meatballs (yes, you can purchase turkey meatballs at a local health food grocery store). I then add half a jar of grape jelly. Purchase the no-sugar kind. I mix with the jelly one half a jar of cocktail sauce, half a teaspoon minced garlic, and a tablespoon of Worcestershire sauce. Dump this over the meatballs and bake covered on 325 F for about 2 hours. (Recipe can also be made in slow cooker. Set on low and cook for 6-8 hours.) 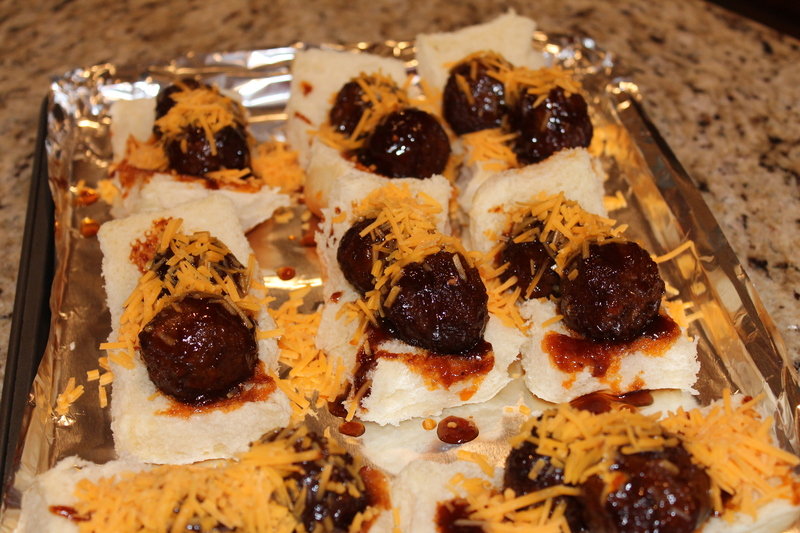 Once done, place a meatball or two on each roll. Top with shredded cheddar. Place tray (which I cover with foil) back in oven on 350 F for about 5 minutes. Remove and top with the other half of the roll and serve. Great with a side salad and chips. We don’t make this real often, but it is a great Friday night dish to have while watching a movie or during a football game. I encourage you to try these for a Super Bowl Party. I promise they will be a hit. Just a little reminder, not everything has to be totally healthy. All things in moderation. But, even with a little thought and planning you can make a meatball sandwich healthier. It’s the healthier we are after. It’s the balance. Life, it’s always about the balance. And for those living in peace, experiencing joy, balance is what they have found. Not perfect balance, but a life that keeps the scales tipping back and forth, never set on one spot. Balance like this blog-my Wednesday recipe a day late. Not by design, but by life. Yet, I have victory. Instead of throwing in the towel I kept on. I persevered and did it -even if a day late!